Aqui, no Centro Médico da Coluna Vertebral, o bloqueio do ramo comunicante cinzento é nosso procedimento de eleição e estamos muito satisfeitos com seus resultados. É um método simples, rápido e eficaz, feito sob orientação de imagem e em regime ambulatorial. Aqui fazemos o que deve ser feito. Estamos a sua disposição para atendimento de urgência, pois quem tem dor tem pressa, e nós temos a resposta eficaz. 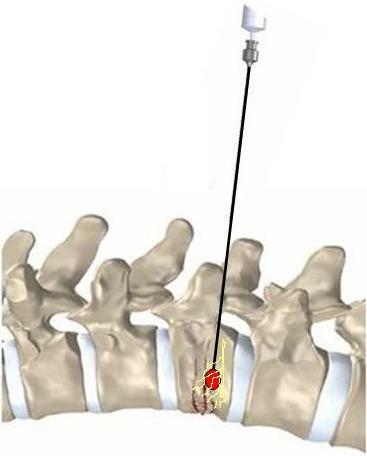 Gray ramus communicans nerve block: novel treatment approach for painful osteoporotic vertebral compression fracture. Chandler G, Dalley G, Hemmer J Jr, Seely T.
Specialty Clinics of Georgia Research Center, Gainesville 30501, USA. Osteoporotic vertebral compression fracture (OVCF) is a common complication of osteoporosis in the aging population. Refractory chronic pain may develop, and few effective treatment options exist. We retrospectively analyzed 52 cases in which gray ramus communicans nerve block was used for painful OVCF after failure of conservative analgesic therapy. All were office-based, fluoroscopically guided procedures; a combination of 2% lidocaine and 2% sterile triamcinolone diacetate (Aristocort) was injected on the gray ramus tract of the somatic nerve root corresponding with radiographically documented OVCF. Patient-reported and physician-reported pain scores, analgesic medication use, and overall patient satisfaction were measured. The average follow-up period was 9 months. A 1-point improvement in pain scores was reported by 92% of patients and 88% of physicians; a 4-point improvement was reported by 63% and 58%, respectively. No patients reported increased pain scores; physicians reported increases in two cases. Decreased analgesic requirement was documented in 42%. Patient satisfaction was "high" in 50% and "medium" in 25%. No procedural complications occurred. Prompt and sustained improvements in all parameters, especially pain scores, support widespread clinical application of this safe effective and cost-effective therapy.